A peak in the far north of the Blue Mountains, above Lake Helevorn. The lands westward of the Blue Mountains were largely consumed by the Sea in the aftermath of the War of Wrath, but the mountains themselves survived. Mount Rerir stood out to the west of the range, but whether it withstood the cataclysm or not is unclear. Maps of this region from the Third Age show highlands where Rerir once stood, but no single peak is shown or labelled. The implication is that Rerir was greatly reduced during the final War of the First Age, but probably not entirely overwhelmed. The name Rerir is not explained, and does not appear to have any obvious Elvish derivation.  It is perhaps derived from the name of the character Rerir in the Völsunga saga. If so it this is a unique etymology among the place-names in the Silmarillion, though the use of sources like this was not unknown to Tolkien. Many of the names of Dwarves in the Third Age, as well as the name 'Gandalf', come from the Poetic Edda, the same source as the Völsunga saga. 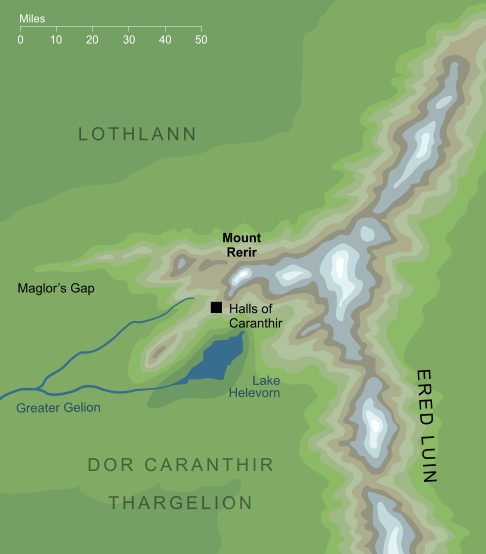 The halls of Caranthir do not appear on any map, but according to Quenta Silmarillion 18, Of the Ruin of Beleriand and the Fall of Fingolfin, the fortress was '...upon the west slopes of Mount Rerir'. However, elsewhere the halls are described as standing beside Lake Helevorn, which lay to the south of the mountain. The map for this entry places Caranthir's halls on the southwestern slopes of Mount Rerir, in an attempt to reconcile these two slightly variant descriptions.